Great starter home or Up North Getaway! 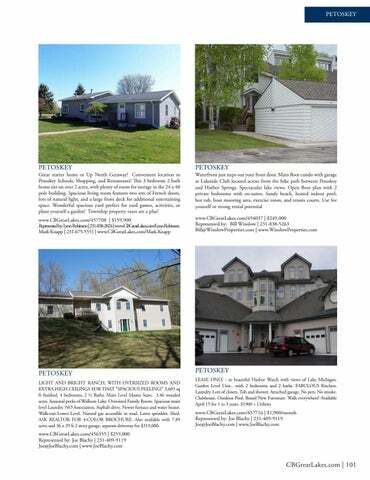 Convenient location to Petoskey Schools, Shopping, and Restaurants! This 3 bedroom 2 bath home sits on over 2 acres, with plenty of room for storage in the 24 x 40 pole building. Spacious living room features two sets of French doors, lots of natural light, and a large front deck for additional entertaining space. Wonderful spacious yard perfect for yard games, activities, or plant yourself a garden! Township property taxes are a plus! PETOSKEY LIGHT AND BRIGHT RANCH, WITH OVERSIZED ROOMS AND EXTRA HIGH CEILINGS FOR THAT “SPACIOUS FEELING!” 3,605 sq ft finished. 4 bedrooms, 2 ½ Baths. Main Level Master Suite. 3.46 wooded acres. Seasonal peeks of Walloon Lake. Oversized Family Room. Spacious main level Laundry. NO Association. Asphalt drive. Newer furnace and water heater. Walk-out Lower Level. Natural gas accessible in road. Lawn sprinkler. Shed. ASK REALTOR FOR 4-COLOR BROCHURE. Also available with 7.89 acres and 36 x 29 ft 2 story garage, separate driveway for $319,000.